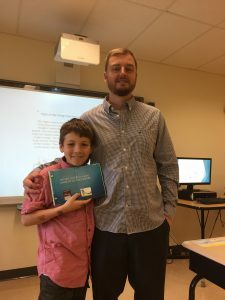 Spaulding Youth Center is pleased to announce the success of its annual Authors Tea, which celebrated the literary accomplishments of its students. Families and staff toured the classrooms and listened to students present their personal creations. Among the offerings were captivating fairy tales and creative comic book stories. Students in one classroom wrote about their favorite off-campus trips, which served as a testament to the wide variety of educational, adventurous and fun activities Spaulding regularly schedules for students. Another classroom wrote and illustrated fun comic books – an assignment that encouraged broad use of imagination and artistic creativity. Students printed, illustrated and bound their books, which included works of fiction, nonfiction and poetry. The majority of students worked to bring their stories to a published level by having their book typed and proofread and then creating a colorful cover and special sections, including About the Author. Annual campus events such as the Authors Tea are conducted to provide instructive and therapeutic outcomes for Spaulding students. This event in particular provides a chance for our students to participate in an exciting school event where they can experience confidence-building success and allows parents the opportunity to watch their child thrive in an integrated educational activity.